Description: Text log files, for each SecureAuth realm, operate on toggle switch. 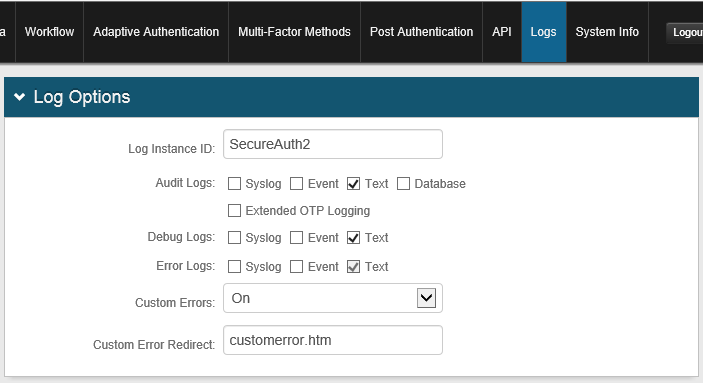 By default, Error logging is always enabled, but Audit and Debug logging can be enabled or disabled. This is determined by the Text checkbox found under the realm's Logs tab, through the Admin Console. Once enabled, logging will remain enabled until disabled. Because of this, log files can pile up quick and take up a lot of hard drive space. These files can be selected and cleared in bulk by doing the following. Audit.20*.log: searches the current file directory for all Audit log files dated to a 20XX year. Debug.20*.log: searches the current file directory for all Debug log files dated to a 20XX year. Warning.20*.log: searches the current file directory for all Error log files dated to a 20XX year. *20*.log: searches the current file directory for all log files--Audit, Debug, and Error--dated to a 20XX year. These wild card search strings will exclude the most current Audit, Debug, and Error log files on the server. To remove these files as well, remove the *20* prefix to any search string. Back logged files are saved with the following naming format Type.YYYY-MM-DD.Log. - Press the Delete keyboard key, or right-click and select Delete, to remove all found log files from the IdP server.